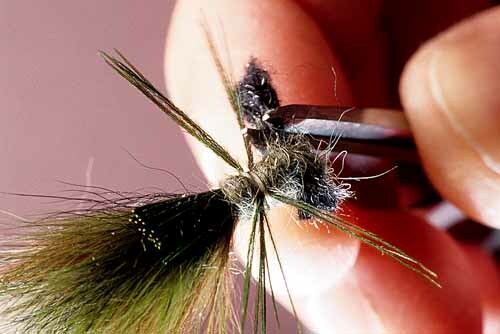 In this section, Skip's Furry Dragon Tying Steps, Skip outlines clear and simple instruction on how to tie his imitation of these nymphs, the life-like (and highly effective) Skip's Furry Dragon. 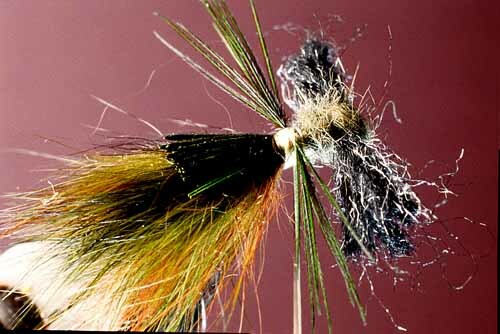 Hook: Heavy wire, short to regular shank, sizes 10 to 4. Thread: Green 3/0. (Brown, if you are tying brown for Libellulidae). Abdomen: For the darner, combinations of dark-green with tiny bunches of black rabbit fur on top, three bunches (for Libellulidae, browns and tans or light-green may be more appropriate, though probably no more effective). Eyes: Black or dark brown wool or soft Antron yarn, or a slim strip of Furry Foam. 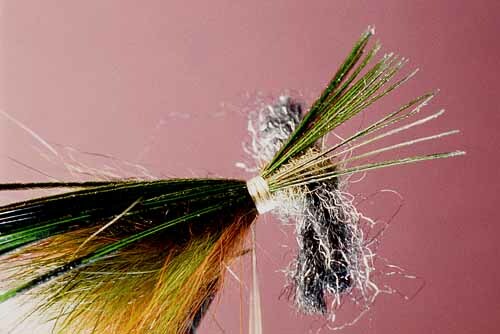 Wing Case and Legs: Natural or dyed-dark-green pheasant-tail fibers. 1. 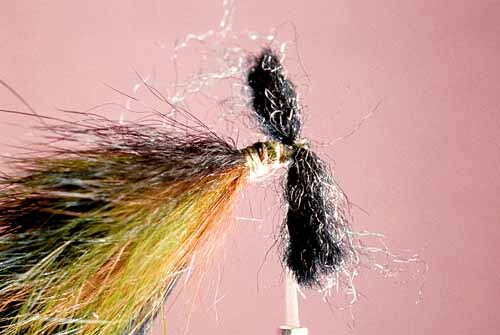 Start the thread in the center of the shank and then wind it back in tight turns to the hook's bend. Snip a bunch of dark-green rabbit fur from the hide (the best source of this today is "Zonker strips," strips of rabbit hide with fur). 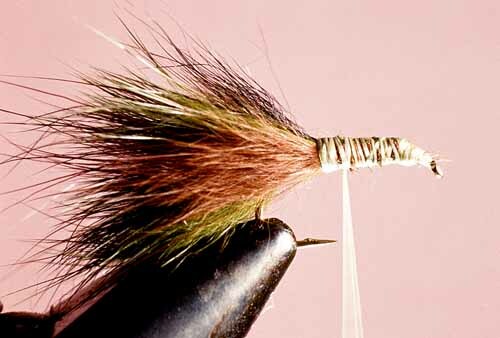 Bind the fur atop the shank, projecting back over the bend. 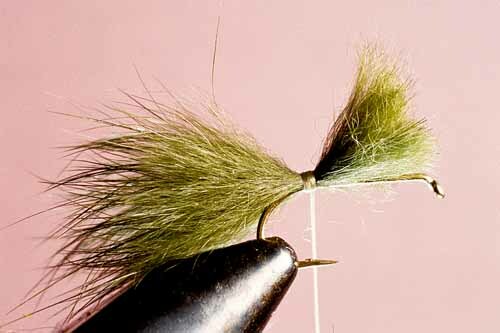 The fur should project about a full hook's length, or slightly more, from the point at which it's bound. 2. 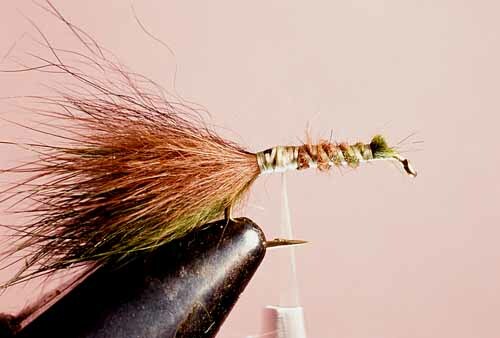 On both the far and near sides of the green, bind a thinner bunch of medium-brown rabbit fur, same length as the green, or slightly shorter (or skip the brown altogether). 3. Atop the green, bind a very thin bunch of black rabbit, as long as the green. 4. 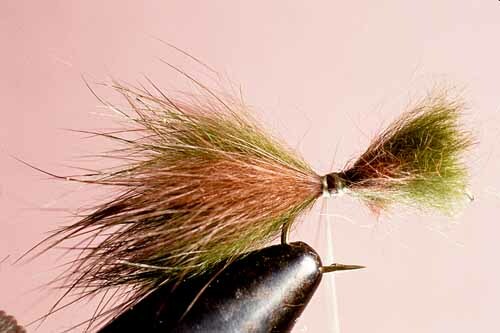 Bind the long butts of the rabbit along the shank, but trim them if they extend beyond the hook's eye. 5. Just ahead of the first bunches of fur, bind a second sequence of bunches and colors as you did the first. Bind the butts of these second bunches as you did the first. These bunches should be slightly shorter than the first. This, combined with their position slightly forward of the first bunches, should put the new fur-tips slightly but noticeably forward of the first tips. 6. Just ahead of the second bunches, repeat the whole process again, (you can omit the brown fur this time if you wish, to give the abdomen more green). Bind the butts and trim them, if necessary, as before. These bunches should be slightly shorter yet than the previous ones. 7. Advance the thread to just behind the hook's eye. Bind a short length of yarn or a Furry Foam strip there, crossways. 8. Dub all around the eyes, to build a head; then dub back halfway between the eyes and the abdomen. 9. 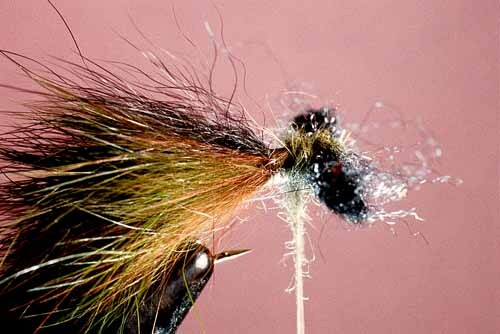 Wind the thread back to the front of the fur abdomen. 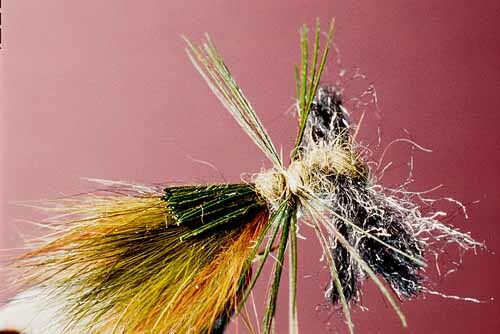 Draw a section of pheasant-tail fibers out to a right angle to the feather's stem. Bind the section with its tips forward and butts back over the abdomen. The tips should project about a full hook's length beyond the point at which they are bound on. Wind the thread over the tip and shank to halfway between the yarn eyes and the abdomen. 10. Tug the pheasant-tips out to the sides in two roughly equal bunches. Secure the bunches straight out with crisscrossed thread-turns. 11. Dub between the abdomen and the tips. Tug the tips on one side out into two bunches. Do the same on the other side. Pinch back the rear bunches from both sides; then wind a few tight thread-turns between the forward and rearward bunches. The fibers should now be divided into four bunches, two on each side, projecting out in two "V"s.
12. Whip finish the thread over the windings between the split fiber-legs. Trim the yarn to two short, but large, eyes (you may prefer to trim the eyes earlier in the process). Add head cement to the whip finish. Fish the completed Skip's Furry Dragon on a type II full-sinking line, resulting in constant strikes from big trout (well...it can happen that way—honest!). 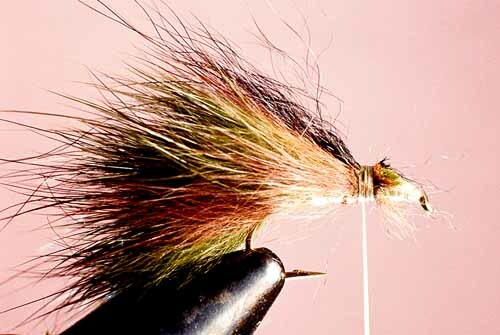 In Skip's Furry Dragon, Part 1, fly fishing author and master fly tier Skip Morris describes the behavior and characteristics of two types of dragonfly nymphs that patrol lake beds. In this section, Part 2, he outlines clear and simple instruction on how to tie his imitation of these nymphs, the life-like (and highly effective) Skip's Furry Dragon. 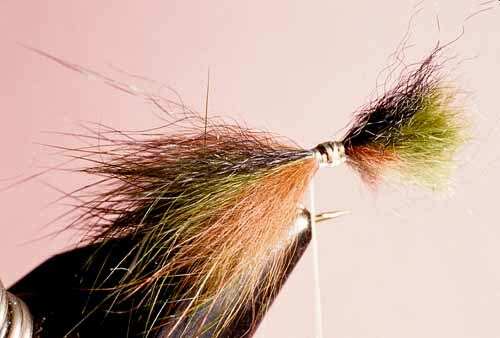 In Part 3, Skip shows you a simplified version of tying the Furry Dragon that is easier to tie, and just as effective.